Arts and crafts can be a great way to foster creativity and spend time together with your kids. Plus, if your child loves fish and the ocean, there’s nothing better than helping them create a craft that they love and will feel attached to. In this article, we will look at 5 great ocean-themed crafts your kids will love! To make any of these crafts extra special, you can add custom made ribbon by Wunderlabel or tag with your logo and sell it on Etsy store. One of the easiest crafts that you can do themed around the ocean is to make paper sea creatures. With this craft, you are only limited by what you can think up. You can do anything from a classic fish outline to creating sharks and deep-sea creatures. To complete this craft, you will need to gather different coloured construction paper but you will specifically want to get a full piece of blue construction paper to use as the background or “ocean” for your fish to live in. If you are looking for a more unique material to work into your crafts, you could always try making these toy fish with CDs. All you need for them is an old CD, some construction paper, and a black permanent marker. The CD will be the base of your fish. When you use it, for extra flair you will want to use it reflective side up. Before you do anything else, you can draw scales on the reflective side of the CD. From there, you should use the construction paper you have to create fins for your fish. You can also add extra touches such as lips and eyes. If your child is more interested in learning how to sew, this felt anchor craft is a great place to start. All you need for it is some stuffing, a needle, thread, and some felt – we suggest blue since it’s a colour so closely associated with the ocean but you can use any colour you’d like. To get started, you will need to cut out two identical anchor shapes from your felt. Then, you will want to thread your needle and start sewing these shapes together. Don’t sew them up all the way yet, though. Once you have the anchor partially sewed up, you should add the stuffing into the anchor to make it puff out and be less flat. Don’t stuff it so much it won’t close the rest of the way. Then, sew it up the rest of the way and you will have a perfectly sewn anchor. First, you will want to fold your paper in half diagonally one way then unfold it and fold it diagonally the other way so that you have two creases. Then, fold it in half longways so that the centre of the “X” of the creases you just made is in the centre of the fold. Do this the other way too. Next, you are going to want to pull the edges of your centre creases in so that you have a triangle. Now take the top triangle and fold the top and bottom points down and up respectively so they cross over one another to make a tail. Once you flip it over, you will have your own little paper fish! Finally, we have a craft where you can make your own jellyfish. For this craft, you will need paper plates, streamers, and some yarn. First, cut the paper plate in half and allow your child to paint it however they wish – this will make the top of your jellyfish. You can get as creative as you want here, adding details like eyes to your jellyfish. 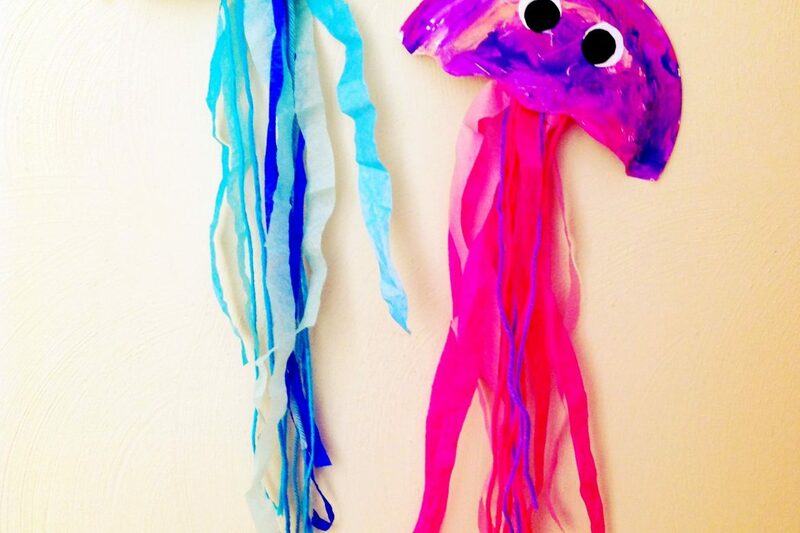 Then, you will want to attach the streamers and ribbon to make the jellyfish’s tentacles. The best way to do this is to attach them with a hot glue gun and let them cool before giving the jellyfish back to your kids.